I was a little surprised upon entering Jammers, of soon-closing show of late works, made in India, by Robert Rauschenberg. These were like nothing I had previously seen of his, and weren’t much more than bits of cloth stuck on the wall, occasionally accented by a can or pole. Rauschenberg made enormous contributions to 20th-century American art: firstly, freeing painting from the age-old paradigm of a “window-on-the-world”. Think of the Mona Lisa: since it is a picture of a woman on a balcony overlooking a landscape it can be said to imply that the viewer is a standing position looking out a window, at her. 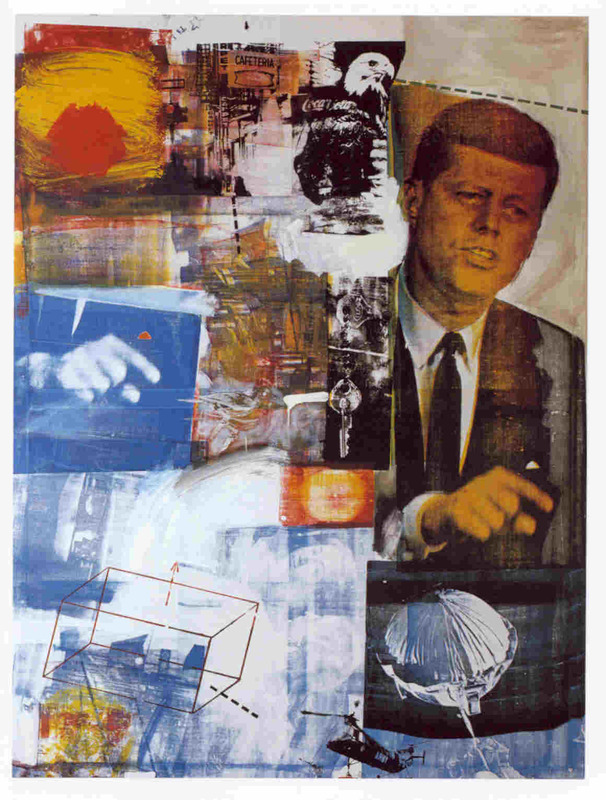 The contrast between this conception of a painting and viewer, and Rauschenberg’s vision can be seen in his image: a collection of (evidently) unconnected, found, images – Kennedy, Kennedy’s hand, an atmospheric balloon, an eagle, a few signs, a helicopter, keys. In a sense, it is a collage of contemporary cultural images and/or symbols. It can also be seen as a rendition of images that might be found, say, lying on a graphic-designer’s work table. This change from the conception of a painting from window to desk was what Leo Steinberg termed the “flatbed picture plane” (flatbed in the sense of a printer, map-table, or a scanner, that is to say, a surface for placing pictures, documents, other flat images upon). Of course, Rauschenberg did a lot more to influence the art of his time, among them erasing (with great difficulty) a Willem De Kooning drawing; working closely with John Cage and Merce Cunningham on music and dance; and trying to bring together science, technology, and art. Against this well-known background of his work, the Jammers series was puzzlingly simple. 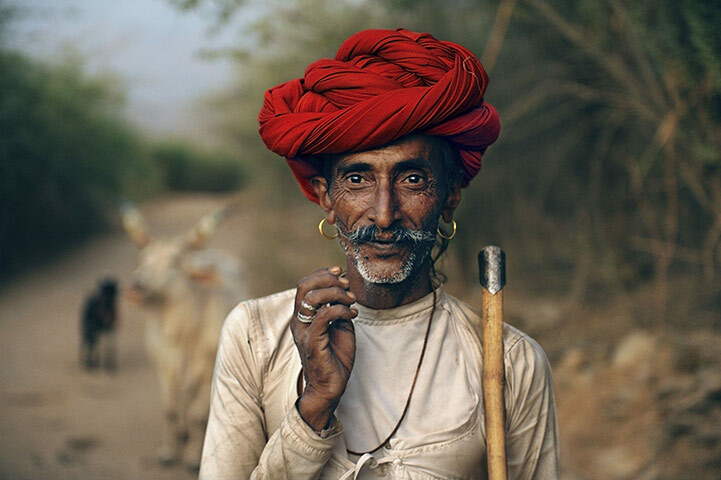 Moreover, the Indian angle was a bit strange: when I hear “Indian light” or “Indian fabric”, two images come to my mind, either the intensely-saturated colours of Steve McCurry’s photographs, or else, poor village washerwomen in a river with piles of sun-bleached clothes. What I didn’t imagine were Indian fabric, arranged in rectangles, completely stripped of any obvious cultural context as clothing, effectively channelled through a lens of Modernism, recalling the squares of Josef Albers (incidentally Rauschenberg’s teacher), but with bits of arte povera and post-Minimalism thrown in. 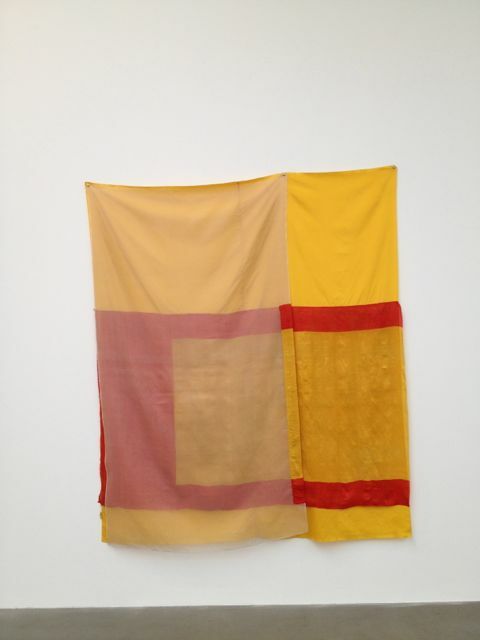 Rauschenberg produced this series while staying with the Sarabhai family in Ahmedabad, a town on the edge of the Thar Desert known for its textile looms. The family had a villa, incidentally designed by Le Corbusier, and had long invited artists to make work on the estate. Rauschenberg’s pieces therefore use the fabric from the area, as well as a adobe clay traditional to the area, made of earth, paper pulp, cotton rags and seeds. So much for historical background. Once I got over the initial shock at the show’s simplicity, and took the time to look, the series’ sheer aesthetics, undemanding of the viewer yet not lacking subtlety, came to the fore. 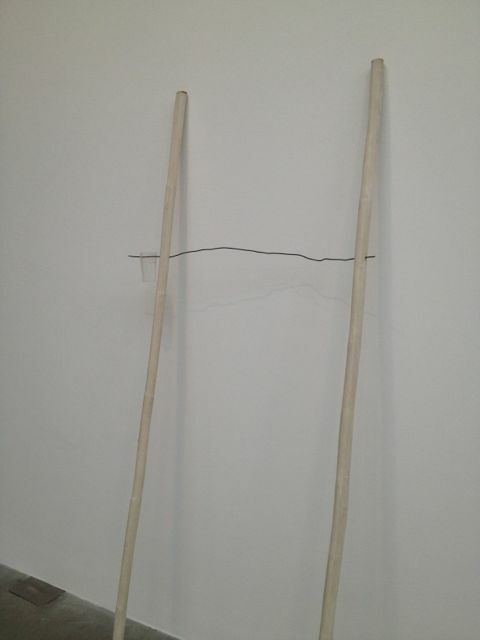 The formal language is sparse: rectangular panels of cloth, bamboo poles, planks of adobe, gauze, wire, bottle, cans. 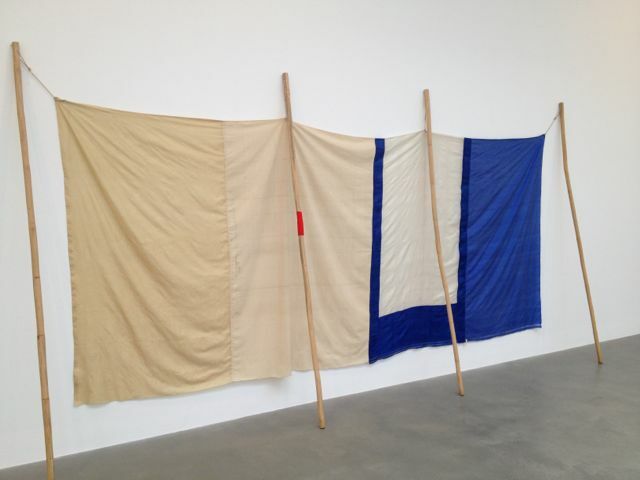 He arranges these simple elements in a variety of configurations that recall sails, or else washing hanging on a line. 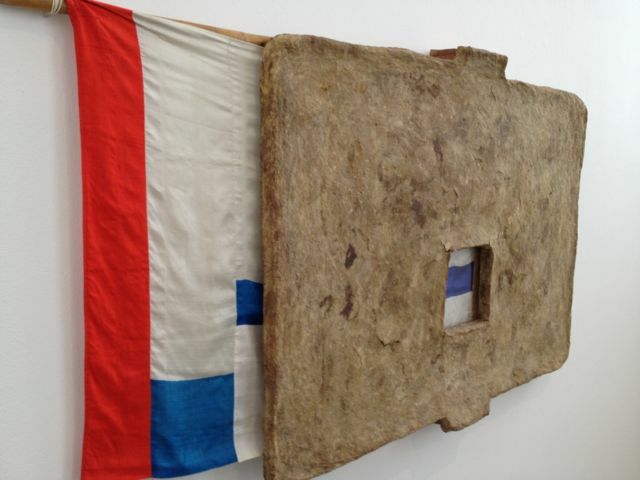 The name Jammers apparently comes from “Windjammer”, a type of sailing ship; Rauschenberg had moved to Captiva Island, Florida, by the time of this series. 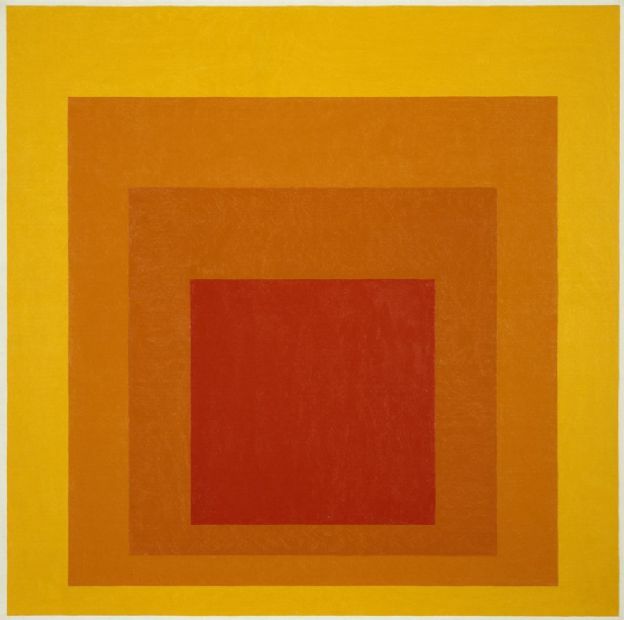 From across the room, many of the works seem to link back to Albers’ works on colour theory, his nested squares of contrasting or complementary colours, and conflations of figure and ground. But there are others that are distinctively Indian, for instance a check fabric, arranged as a pouch, with a pair of tin cans, brings to mind a dhoti or male villagers’ garment. Amusingly, and not unreasonably, one critic interprets the cans as testicles ! 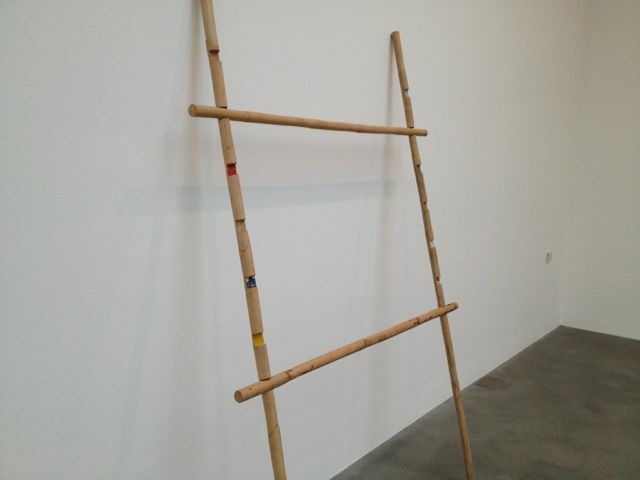 Other pieces, to me, have a more Japanese aesthetic, due to their simple arrangements of squares and bamboo poles, almost like kimonos on a traditional frame. The adobe pieces are amongst the most beautiful, because of the contrast of textures, the relatively high relief, and even the slight smell. At least a few of the works can be seen as simple villagers’ beds, bamboo frames and a bit of fabric; intriguingly, Rauschenberg’s most famous work is probably Bed where he places his own quilt and pillow on the wall, well before Tracy Emin’s sordid interventions. Kimono, cans, and balls ! Close-up, one notices the care with which the pieces are made: these are not just bolts of fabric tacked up on the wall. The mounting holes are carefully stitched, and layers of fabric and gauze are attached in contrasting overlapping arrangements, rather than just hanging free. 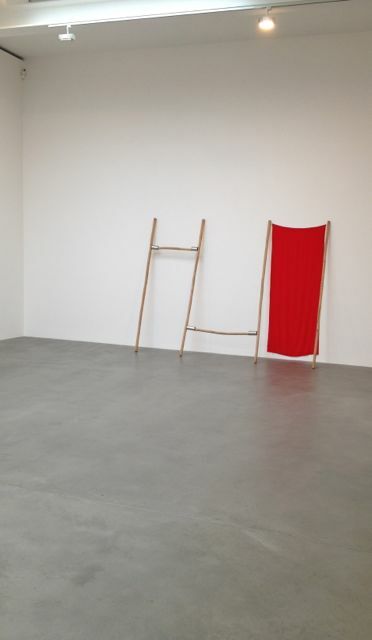 He also seems to echo the formal language of artists like Eva Hesse and Richard Tuttle, with the slight sagging or bulging of the fabric and the gauze, or else the shadows cast by the fabric, poles, or one particularly lovely Tuttle-esque piece, a wire holding a bottle. On the whole, this is a show that rewards a patient look. Jammers combines vibrant Indian colours and Indian references with a great restraint, almost an austerity, which belies the apparent simplicity of the work, and activates the viewer in a way that lies somewhere between classic Minimalism and the rather angsty or ephemeral works of Hesse or Tuttle, respectively. 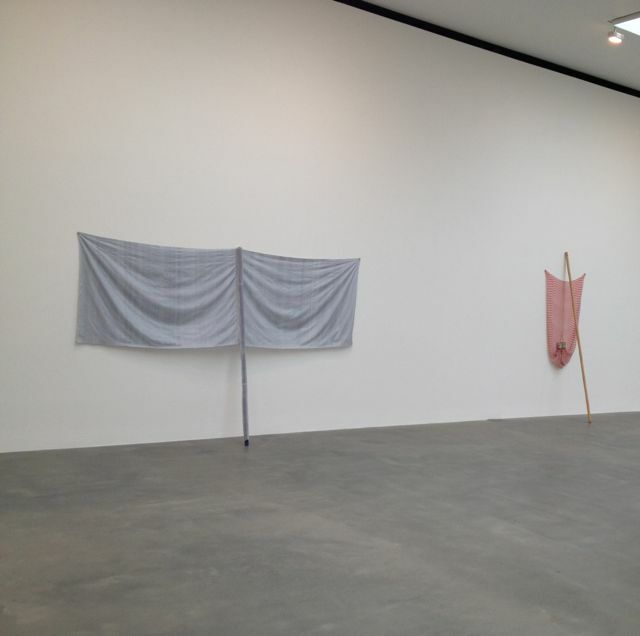 The proof was in the pudding: fairly early on a Saturday, there were 20-30 people with their noses up against the wall looking, almost touching, blowing on, and generally interrogating these ostensibly trivial bits of cloth. Adobe of mud, paper pulp, rags, fenugreek seeds, and tamarind.